Identification with the mind and the body can lead us to form a number of mental and emotional attachments and we can become so attached to something that we become identified with it. Attachment comes in many guises. We can be attached to a number of different aspects of life and in many different ways. On the physical level we can be attached to things, outcomes and people. On the emotional level we can be attached to feeling a particular way, be it pleasure, self-pity or some other emotion. On the mental level we can be attached to ideas, concepts, beliefs and ideologies. We can also be attached to being right, feeling clever, being rescued or helping people. When the sports team we support is not winning and we begin to feel bad we can remind ourselves that we are not the sports team. The same applies when we want our favourite people to win some kind of contest or prize – we can remind ourselves that we are not them and that we have become temporarily identified with them which is why we desperately want them to do well. When we do not feel good we can remind ourselves that we are not our feelings. When we feel confused or get something wrong we can remind ourselves that we are not our minds. The antidote to attachment is to let go, to return to our centre and remind ourselves that “I am”. Not “I am this” or “I am that” but simply “I am”. “I am” is as close as we can get in words to our true Self. The reason that we often don’t see our attachments is because we have become identified with the object of our attachment and do not remember life before we became attached. When we watch films many of us will temporarily identify with one of the characters. After the film has finished this feeling of identification tends to wear off. But if we see a film which strikes a chord with us the sense of identification can become stronger, and if we watch the film repeatedly every day we could become so identified with the character that, to all intents and purposes, we become that character in our minds. This is what it is like for the beliefs we adopted when we were children – these beliefs are like films which we have watched repeatedly for many years. We have become so identified with them that we no longer see them as something separate from us, which is why we do not see the attachment. This is particularly noticeable with beliefs and ideologies which people fight for. If you attack someone’s belief he can fight back as if it was his very being that was being attacked. Defensiveness is almost always a sign of identification and attachment. One common example of attachment is attachment to negative thinking, or selectively filtering out all the positive events to create a timeline of negative ones. For example let’s say that something happens on Monday which causes us to feel bad. Then on Tuesday something else happens which also causes us to feel bad. Come Wednesday when something else happens and we feel bad we might conclude that “it is one thing after another” meaning that life is just an endless string of bad things happening. But what happened on Monday was just one event. On Tuesday it was just one event. These events only become “one thing after another” if that is the story we choose to tell about our life. If we want to tell a positive story about our life we could say that “on Monday so many things went right and only one thing happened which made me feel bad. I feel blessed that so much of my life just goes right without my having to think about it. It was the same for the next two days – only a couple of things happened which weren’t according to plan. That’s not bad going really when you think about it”. If we choose to tell the story that it is “one thing after another” it means that we want to tell people how much we are suffering, which in turn means that one or more of our emotional wounds is coming to the surface and asking to be healed. In some oriental philosophies phenomena are described in terms of what they are not instead of what they are. If we attempt to describe phenomena in terms of what they are we can become attached to the words used in the description and not see the reality of the phenomena. Describing phenomena or states of being in terms of what they are not can allow a sense of what they are to emerge without attaching too many words to that feeling. In many ways identification and attachment are very closely linked, consequently we can practise non-identification and non-attachment together, by standing back from the situation and reminding ourselves that we are not the situation. We have a tendency to project our identities out into the world and see events, outcomes and other people as extensions of our own self. 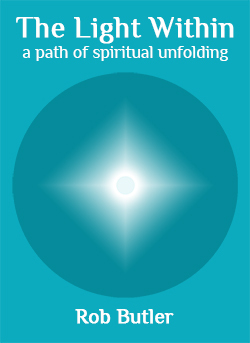 In order to reverse this trend we can visualise these outer aspects as being outside of a circle, with our true Self being in the centre of the circle. By withdrawing our attention from these outer aspects and bringing it back into the centre of the circle we can loosen our attachment to outer aspects and reduce our identification with them. Similarly we can see the mind and the body as being outside of the inner circle of our true Self. Figure 2, opposite, is one way in which we can represent how we project outside of ourselves and become identified with aspects of our experience which are other than who we are in essence (please note this is a symbolic representation of experience and not intended to suggest that the physical, mental or emotional “bodies” actually exist in these locations – as ever it is just one viewpoint). *5 = Identification with other people, events and outcomes – at this level our sense of well-being tends to come from the success of other people and from events in the outer world which turn out the way we want them to. 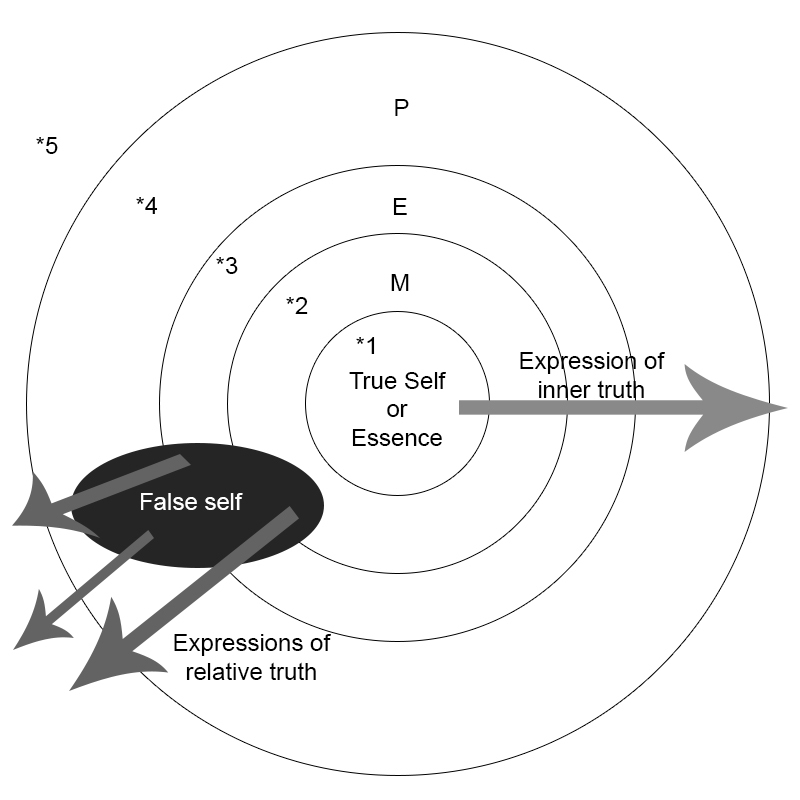 The false self in the diagram refers to who we think we are as opposed to who we really are which is represented by the true Self. Each time we act out a thought, feeling or habit of the false self we can practise non-identification to bring our conscious awareness into closer alignment with our true Self.